Whatsapp is working on implemention of video chat call on the very whatsapp chat app we all know or uses, just like the way it is on Facebook messenger. Although previously, they released a Beta version of the video features which is not in appearance anymore or to be found anywhere. It disappeared from the beta version showing that it will show up again fully activated on all devices. Whatsapp made effort in implementing voice call chat on whatsapp previously. after that so many was put to discovery. They increased group members to be 250 in numbers and even as that, theyprovided an option for sending PDF files for friends when chating. 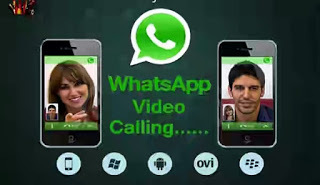 Most of the people that was opportuned to test Beta version of whatsapp video chat call testified that each time they want to make video call, that there is always a popup either for you to choose video or voice call. √ Read this also: How To Download & Install Whatsapp App On PC & Mac Computer. The video and voice calls uses Megabyte for them to work or connects. √ Very important, Do Check On this as well: How To Know Original Charger For Your Phone And The Rate At Which The Device Charges With Different Chargers.